← On the Road, Again: To New Mexico! 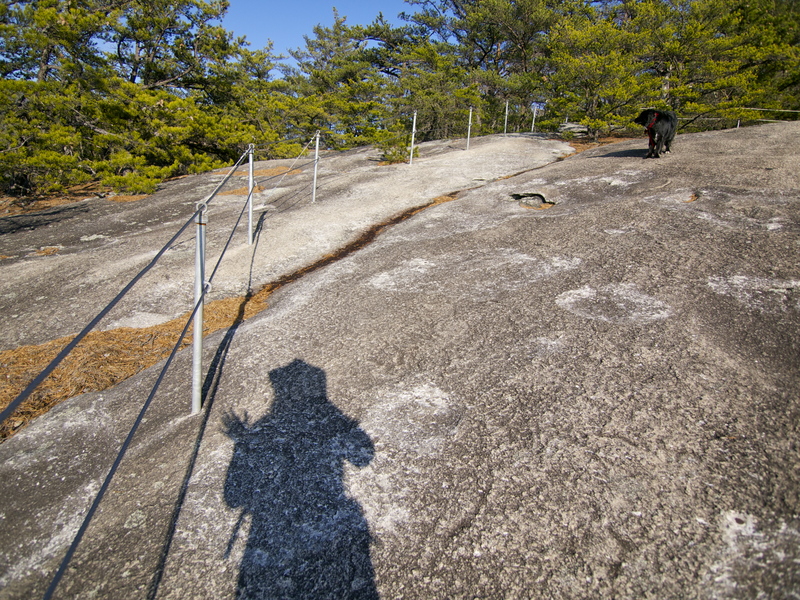 Stone Mountain: North Carolina’s Mini-Yosemite! After a whirlwind road trip to the Florida Keys, you might think I’d be ready for a break from the road. But that’s not really how I roll. Once I get moving, I don’t want to stop! So I hitched up the Raven & the Rattler, packed a few things for the summer and hit the road West. After an unexpected but delightful three-day snow delay in Fayetteville, West Virginia, I booked it due south, chasing more spring-like weather. Cruising the Blue Ridge Parkway through northern North Carolina, I pulled over at an overlook and discovered a mini-Yosemite: a great granite dome capped one of the rolling mountains in the valley below. 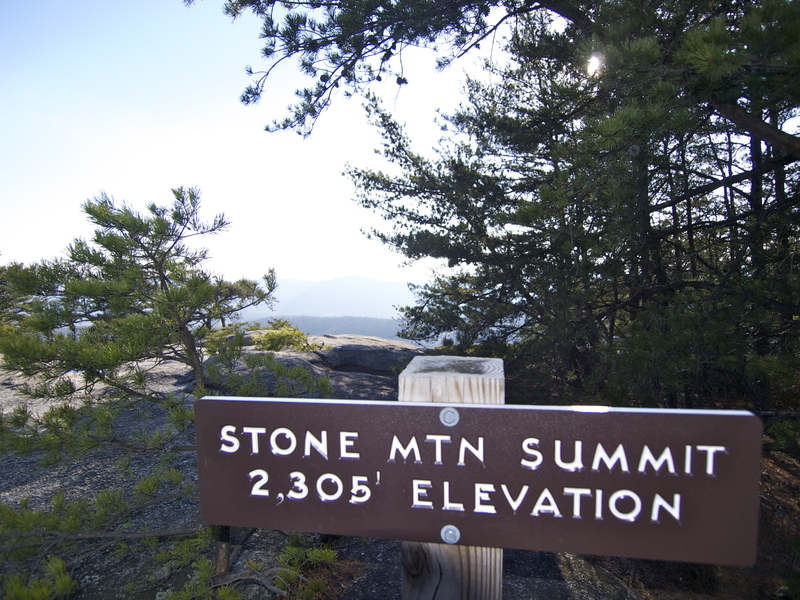 According to my Adventure Atlas, it was Stone Mountain, home of Stone Mountain State Park. I was willing to bet that a trail went to the top of that dome. Time for a hike! I’ve been to Yosemite a few times and I’ve always wanted to climb Half-Dome, but I’m put off by the lottery system, which seems to do little to curb the masses of people who line up to climb Yosemite’s most famous massif. The hike is a walk-up, along fixed-line cables bolted into the rock, but the sheer exposure can be deadly: each year, a few people tumble off, often in wet weather. Sounds epic, but from the photos I’ve seen, it looks like you spend most of the day in line, waiting for nervous novice hikers ahead to gather their wits about them to take another step, clinging to the cables strung up the steep, sheer rock. I try to have patience for sharing the trails in National Parks, but I’m not one for waiting in line for anything. 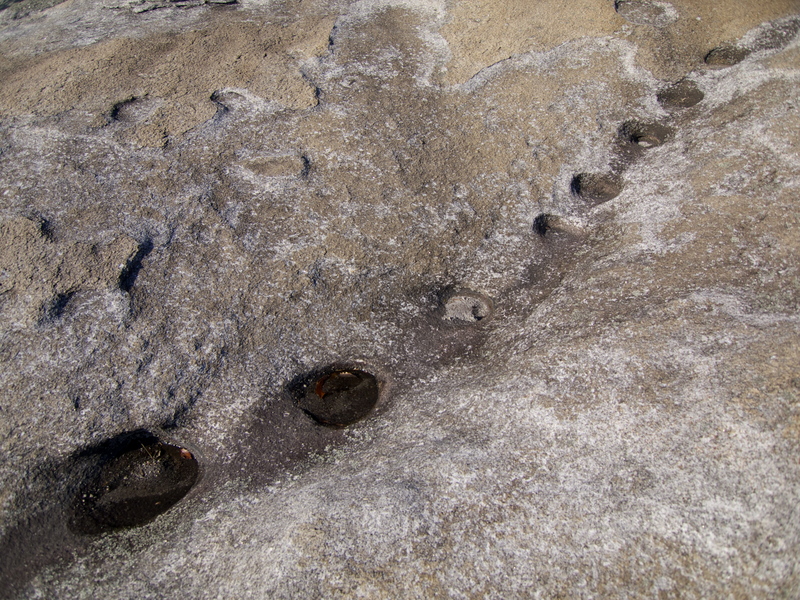 I doubt Stone Mountain is any kind of substitute for Half Dome, but I loved the feel of solid granite under my feet. The four-mile loop took me up, across and down the dome and I met a few other hikers and no climbers. After my hike, I checked out the climbing permit station at the base of the rock. Expert climbers only! No kidding. This rock isn’t as tall as Yosemite’s famously big walls, but granite is granite: unyielding and unforgiving. 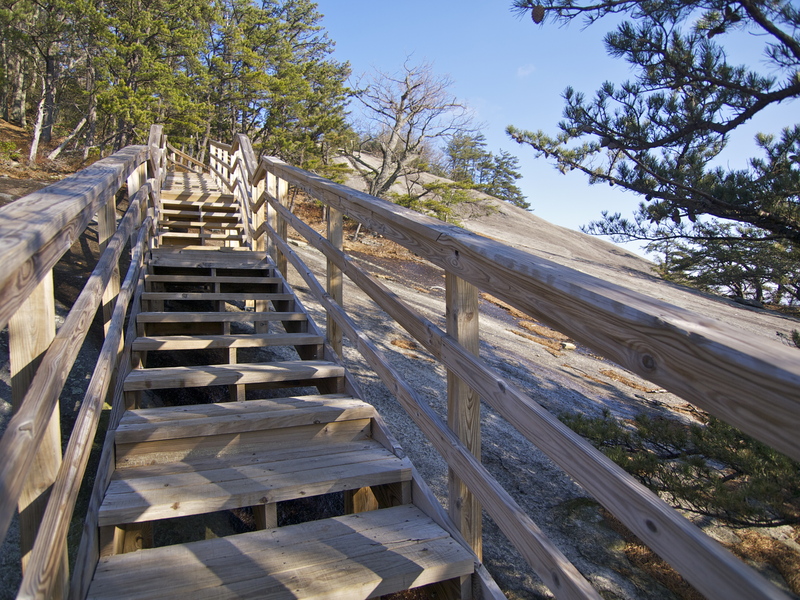 The Way Up Stone Mountain, unless you’re an “expert climber”, which I certainly am not. Cables near the summit. No line! 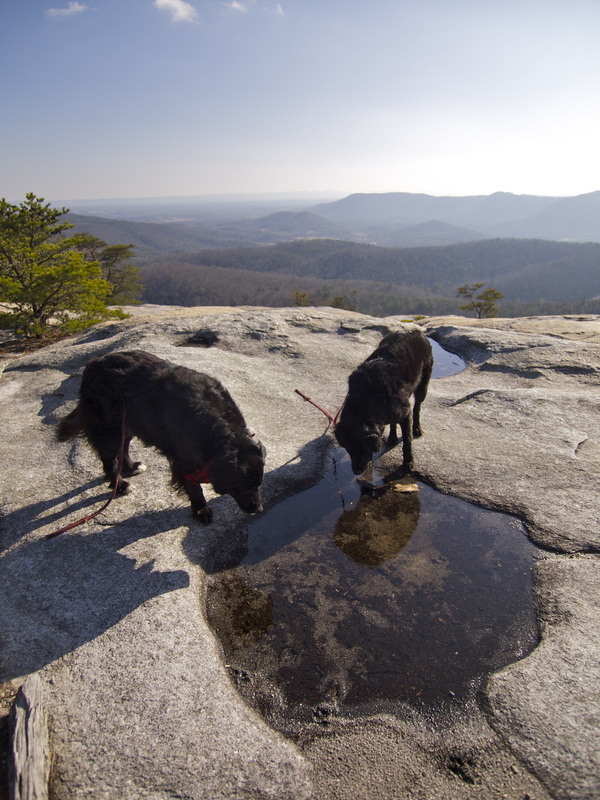 Dogs drinking out of opferkessels on the summit. Yes, that’s my new favorite word. 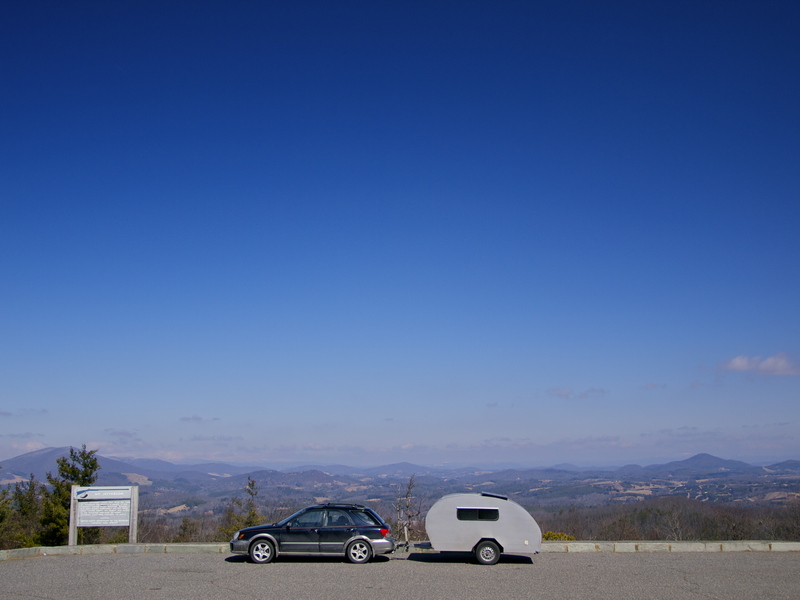 This entry was posted in Bowie & D.O.G., Hiking!, Photography, Road tripping!, Teardrop Trailer, Uncategorized, Vagabonding 101 and tagged Blue Ridge Parkway, North Carolina, Stone Mountain. Bookmark the permalink. 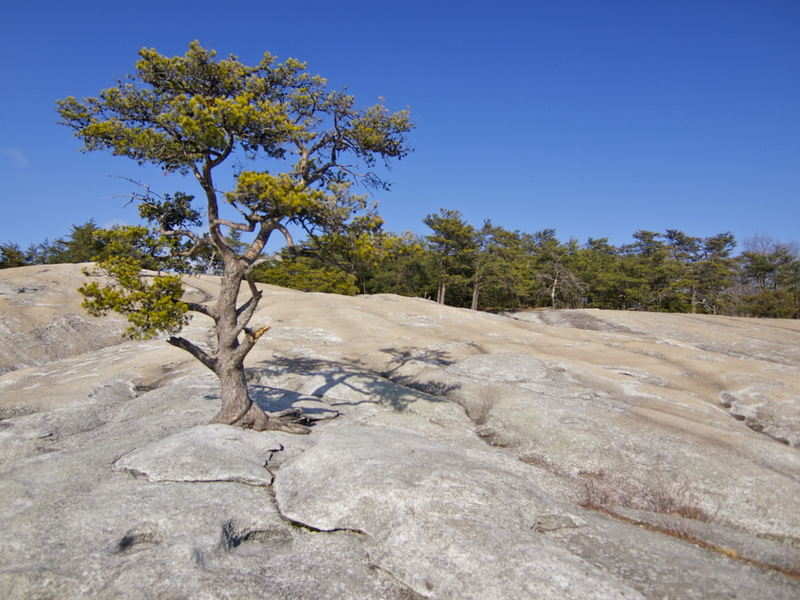 16 Responses to Stone Mountain: North Carolina’s Mini-Yosemite! What a great view of the NC mountain range! I can be on the parkway in about five minutes from my house – there is always something new to see. Wish I had travel buddies like yours. Love the pictures of them! Love the pictures. I live within an hour of Yosemite, and your conclusions about Half Dome is exactly correct. Although long past my hiking days, friends have described the hike as less adventure and more waiting in long lines of neophytes, tourists all who have no clue of the dangers ahead. Much like our coastline tourists, who have no respect for the sea, and the might of an ocean wave and its ability to sweep you off the rocks and into oblivion. The Stone Mountain Hams is a priceless pic! Haha thanks. They’re too cute and they know it. Dangerous combo. Gets me every time. If you go through Texas make a stop at Enchanted Mountain State Park (?) It is right outside of Llano, Texas, sort of on your way. They only other place besides Stone Mountain in the country with the uplifted granite domes exposed, and one of my favorite places. You being into geology it should be worth your wile! It’s also a nice hike/climb area. Maybe you should do a story. If I remember from my geology 101 there is only one other place in the world that is like these two, and that one is in Australia. Wonderful post Mary, and as usual great pics. 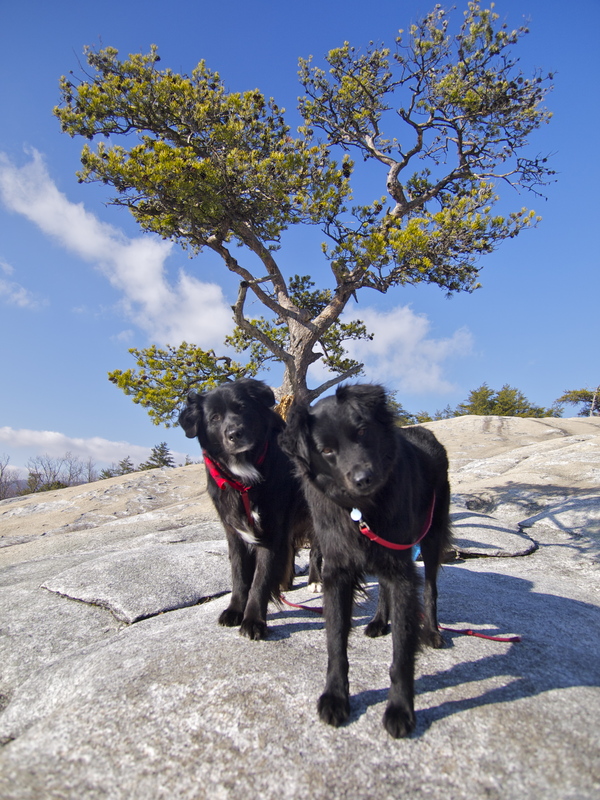 I always look forward to reading and seeing your travels.Love the pic of your adorable dogs .Stone Mountain Hams. As always, I love all your pictures, but… the one of the dogs in front of the tree was awesome. They are just great, you are lucky to have such great buddies and they sure are lucky they have you. They are living a dog’s dream life ! Such a great mountain. I love reaching to top with your adventure. Looks like a twin of Stone Mountain, GA!! Have fun in TN! If you have time, try to camp at the Meriwether Lewis campground right off the Natchez Trace Parkway. The Parkway is a small two lane road that follows an old covered wagon trail and is now a national park. There is no entrance fee and the camping at Meriwether Lewis is free! In the same area is a grave of Mr. Lewis of Lewis and Clark fame and it gives the whole history of the area. There are lots of great hikes around there and an eight miler that starts and ends at the campground. 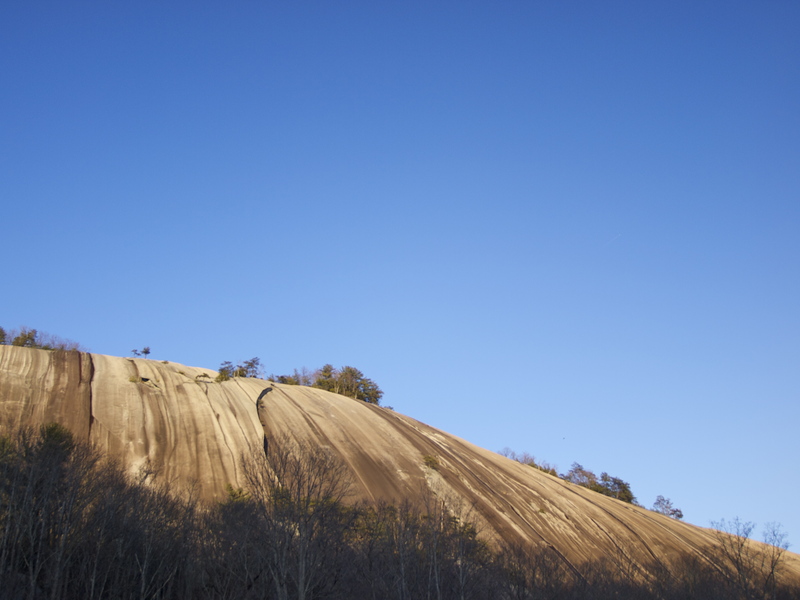 It’s no Stone Mountain, but pretty cool to see the history and it’s beautiful….it’s also in your NG Adventure Atlas! I’d never heard of an opferkessel before. That’s a seriously great word.